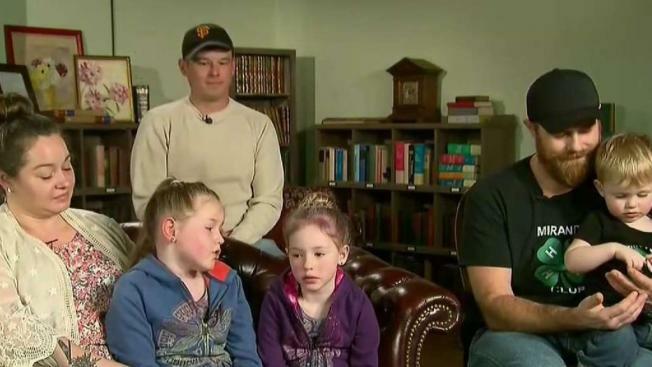 Armed with some outdoor survival training, granola bars and pink rubber boots, 5- and 8-year-old sisters survived 44 hours in rugged Northern California wilderness before they were found dehydrated and cold but in good spirits on Sunday, authorities said. A fire chief and firefighter from a local volunteer department found Leia and Caroline Carrico in a wooded area about 1.4 miles from their home in the small community of Benbow, where they had last been seen Friday afternoon, Humboldt County Sheriff William Honsal said. Benbow is about 200 miles northwest of Sacramento. The girls were "safe and sound" and uninjured, thanks in part to survival training they got with their local 4-H club, Honsal said. "This is an absolute miracle," he said. "This is rugged territory, this is an extreme environment. How they were out there for 44 hours is pretty amazing." The girls on Monday explained what they did to survive. "We found shelter in a tree branch and stayed close to the ground with my sister's jacket to keep us warm," Leia said. "We stayed put, and when we woke up, we went to the creek and sang nursery rhymes at the top of our lungs all morning." A photo of one of the girls posted by the sheriff's office and already being widely shared on social media shows her wearing pink rubber boots, dirty jeans, a long pink shirt and a woolen cap. She is standing while a firefighter kneels down and talks to her. One person commented that "she looks like a seasoned outdoor gal" while another said, "those little adventurers will sure have a story to tell!" Honsal said the girls were given fresh warm clothes, water and food and were being assessed but were in good spirits and doing well. "A lot of us didn't get any sleep the last 48 hours or so," Honsal said. "To have a positive outcome like this is just absolutely amazing ... These girls definitely have a survival story to tell." He said the firefighters who found the girls had followed their boot prints. The firefighters were part of a massive search of a vast and rugged rural area that included a dozen agencies, including the National Guard, helicopters and tracking dogs. Rescuers were hopeful about finding the girls Saturday after they came across prints from their boots and wrappers from granola bars, Lt. Mike Fridley said. "The wrappers showed us a direction from where they started to where the wrappers ended up at," Fridley said. Fridley said he was the one who got to call the girls' mother and tell them her daughters were alive. "She melted on the phone," he said.